This example shows how the blog post http://example.com/blog.html was createdBy Alice. The blog post was createdWith the software WordPress. The content of the blog was importedFrom http://example.com/data.csv (presumably a CSV file), and this was importedBy the script csv2html. Additional PAV properties allows specifying attributions like contributors, the provider in addition to other kind of sources, such as direct downloading, verification against source material and derivation when further refinements have been made. Data can be given a version number, indicate its lineage to a previous version, and indicate when a source was last updated. This “flat” approach mean that it is easy to use and query PAV without a deep understanding of provenance models, but at a small cost that more complex relationships are not expressed. For instance, pav:authoredBy allows multiple authors, but if there are multiple authors we won’t know who wrote what; or when they did so. Such details can be included alongside PAV using other PROV statements. Here’s an example combining PAV with another PROV extension, the Provenance Vocabulary. This example shows how http://example.com/data.csv was downloaded from http://example.org/originalData with HTTP 1.1 and requesting Accept: text/csv by content negotiation. The PAV term pav:retrievedFrom gives the short-cut to the original data, while prv:retrievedBy gives details of the transport and content-negotiation used in the download. By combining vocabularies in such an approach it is possible to query the provenance for PAV statements in order to get a general overview of the provenance, and then explore other PROV statements for more specific details, which structure might not be known in advance. 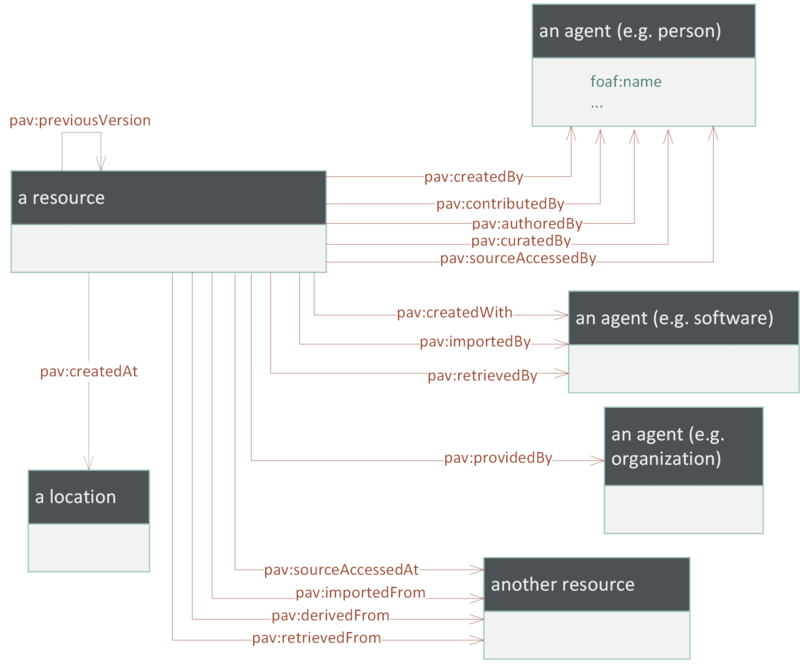 To use PAV, import the PAV ontology from the namespace http://purl.org/pav/ and read the PAV documentation. The PAV wiki pages contain details about the PAV versions. for the latest patch version of 2.1 (ie. no new terms will be added later).